Set montare/demontare rulmenți roată , bucşi MERCEDES W140, W126, W124.- ZIMBER. Used for R and R of rear wheel bearing located in wheel carrier. 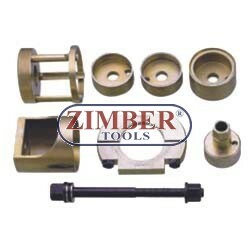 This tool can also be used to install the rear axle shaft flange. ‧Applicable: Models W140, W126, W124.